I originally published this on Sept.5, 2009 after discovering that a local radio station had changed hands and call letters. My youngest was about 17 months old at the time. It was a sad time but I am re-posting it because I am excited to say we have a ‘new’ LOUIE FM in Louisville!! 104.3 WLUE. The format is good….lots of old songs I haven’t heard forever, but what is even better is the look on my kids’ faces when they heard the station identification!! I know it is weird to say I am upset that 100.5 LOUIE FM is no longer. But I am seriously upset about it. It is now called Gen X radio or something like that. The new music format is okay…I have heard many songs over the past couple of days that I hadn’t heard in 10 years!! But, I cannot get over the fact that I will never hear “You are listening to 100.5, LOUIE FM.” It had a very special meaning to our family. Again, sounds weird, I know! Let me explain. A few days before our youngest was born, hubby and I came to the mutual realization that we weren’t so crazy about the boy name we had picked out for him. We have used family names for all of our kids (first and middle), so by the fourth child and third boy, the pickings were getting pretty slim. However, we both agreed that we kinda like the name Louis Frederick (nickname Louie), after hubby’s Dad, Fred, aka Frederick Louis. But, we were going to wait until he was born to make the final decision. And we had learned the lesson early not to tell anyone the names we were considering!! Well, as soon as baby #4 was born, we looked at each, while everyone else was inquiring, “What’s his name? !”, and we both said “Louis Frederick” and that is when our little Louie was introduced to the family. Ben’s Dad had no idea that we were even thinking about using his name and I will never forgot when he was holding Louie in the hospital, nearly too emotional to speak. It is a moment that will forever be burned into my memory. On our way home from the hospital, we were listening to the radio when we heard “You are listening to 100.5 LOUIE FM.” Again, hubby and I looked at each other and just laughed. Our Louie’s name was Louie FM (Louis Frederick M****). And hubby joked that it was very fitting all the way around, because his Dad had spent his whole life in the radio business. Whenever the older kids would get in the car and hear the call letters, they would always make a big deal about it. It was something that always brought a smile to our faces. It was fun and comforting at the same time. It became even more meaningful when my father-in-law lost his battle with pancreatic cancer, just a few weeks after holding his namesake for the first and only time. LOUIE FM always reminded me of the connection that Louie held with his PawPaw, even though he would never get to know him. So, I am upset that I will never be able to turn the radio on again and hear “LOUIE FM”. I am sad that the family won’t be able to joke about Louie’s station anymore. I am heartbroken that Louie won’t be able to hear those call letters and be reminded of the love his PawPaw had for him, even before he was born. Here is my request….if anyone has ANY connection at Clear Channel, I need your help! 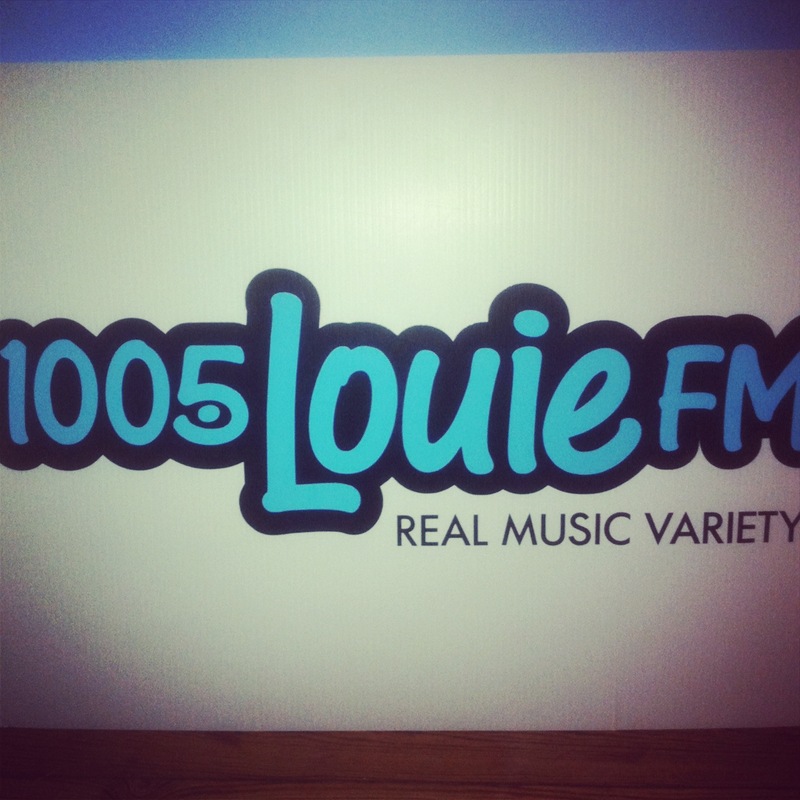 I would love to have a couple of things (bumper stickers, t-shirts, etc) that said 100.5 LOUIE FM on them. I want to save them so that when Louie is older I can show it to him and we can re-tell the story and it will be part of HIS history…not just part of history. Thank you in advance! And I was able to get a few items that say LOUIE FM on them…posters and plastic cups. If someone at the new LOUIE FM would like to send keepsakes my way, I will not deny them! 😉 I would love to surround my budding musician with reminders that his love of music comes from someone very special who is no longer with us. I can say all this because we know the good parts of parenthood–the hugs, the kisses, the ‘I wuv ew’. But it is the ups and downs that bond all parents. You can instantly start a conversation with any other parent…it is like trading war stories! Sometimes it is hard to think of sharing such an intimate thing with someone famous, but if we are all parents, then its all shared! And that is what makes me love this video so much. Crackerfarm has put out some of the best videos of The Avett Brothers, but this one is tops! I love that Scott is trying to play at hymn at his home, yet his daughter has drastically different ideas. She may be the only girl I know who would forcibly try to stop Scott from performing! 😉 And I love the look on his face and the laughter in his voice…it’s like he is saying, ‘Really?! I can’t just sneak one song in? !” Yes, Scott…we have all been there before. Fortunately, a camera wasn’t around. Enjoy this sweet, funny video on this Monday morning! Make sure you feel totally comfortable with the school and educators. Speaking from experience, if you know that you your teacher loves your child, then saying goodbye between gulps will be less painful since the trust is there. If your gut is telling you something is amiss, then don’t ignore it!!! That is your parental instinct kicking in….it is like your superpower-use it!! Assuming all is good with the school, then it is time to let go and give your child a chance to grow socially and build confidence. It is okay…to give your child a chance to learn how to comfort themselves when you aren’t around. This is a big deal and something that will help them in the future. If they need that special lovie in their backpack, then do it. It is okay….to watch your child’s confidence grow. They love bringing home their school work-to show you what they can do! They aren’t babies any more, they are big kids. We know what our children are capable of, but sometimes it takes an outside person to show us that we should expect more. I never thought that L, at 3 yrs old, could spell his (short) name. But guess who surprised Mama on his 2nd day of school!! And he was sooo proud of himself!! Transitions are hard for kids, but sometimes they are harder for parents. We all want to raise successful adults (even though our measurements of success may vary) and we all know our children have special talents and strengths that they should share with the world. Pre-school (or even over night camp for the first time) is a stepping stone on that learning path for us and our children. This song, “We Were Born” by Cloud Cult, is so beautiful and meaningful. It just seems like a good fit for this idea of letting our children go…just a little bit! So, a hug, a kiss, a be back soon and this on repeat. I don’t know where we come from, and I don’t know where we go. But my arms were made to hold you, so I will never let you go. Cuz you were born to change this life.